For our privileged customers, we have introduced Satguru Pictures under the wider assortment of art & craft pieces. These paintings are prepared by our in-house artisans using qualitative materials and thus, are offered with perfect finish & brilliant color combinations. Offered paintings are delivered with protective packaging at reasonable rates. 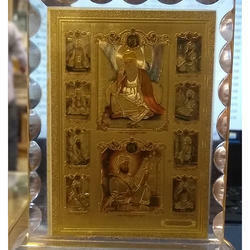 Looking for Gold foil God Frames ?